Fits in even the smallest of spaces. The SANIMARIN compact range includes reduced height toilets to be installed on boats and/or to replace manual toilets. These toilets, in compact sizes, have been designed and conceived to be quickly and easily installed to give you all the comfort you deserve ! A Saniflo unit to replace your manual toilet whatever your original configuration. By using pressurised water on board, this quiet toilet offers maximum comfort. Highly efficient, it can be fitted into any configuration. 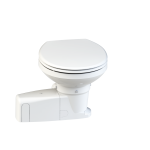 With its compact design, this toilet can be easily installed in the most confined spaces. This practical, Short designer model is ideal for setting up on a coaming. Its vertical back line makes it very easy to install.